As I embark on the third year of an illustrious teaching career, I’d like to believe that I model admirable personal qualities for my students. Hopefully the terrible lack of discipline I’m exhibiting right now won’t last long enough to rub off on any of them. The Lusher students received their class schedules on Monday, and attended the first day of classes on Tuesday. This whole first week consisted of last minute preparations for me, and I’ve been meaning to do some major catching up and planning ahead this weekend. So far, though, I’ve done nothing. Yesterday afternoon I hung out with the Lusher happy hour crowd for a few hours, even though I quit drinking about a month ago. I came home with good intentions of addressing school issues. Instead, I started working on a small Flash project, which I finished this morning. And of course now I’m gifting my zillions of adoring cyber-fans with a web journal update. I’ve always struggled with procrastination, yet at least I know my limits now better than I used to. If history is any indication, I’ll spend all day tomorrow taking care of business, and I will feel much more caught up during the second week of school. Despite feeling somewhat unprepared, the first week actually went quite well. We have probably two-dozen new faculty members and a large new freshman class to make this the first year that Lusher high school has all four grades. My five periods of Algebra 2 contain students who are new to me since they took Geometry last year. My one period of AP Calculus has most of the students who took PreCalculus with me last year. With about 111 students total, I have significantly more than the 75 or so that I had last year, but my class sizes are still not unreasonable. I like the looks of my schedule this year. I became quite attached to my students from last year, but I also allowed too many of them to slip into poor habits and behavior in my classroom. I appreciate the opportunity to make a fresh start with a new group and clearly define from the start how I want my class to be (now that I also have a clearer vision myself). I enjoy having the one class of students who were with me last year since a little familiarity is always comforting. Demonstrating my point, a few of those familiar students immediately fell right back into the same disruptive habits that I let them get away with last year. I hope I made it clear this week that they’ll all need to help me impart some positive changes, especially since college credit is at stake with Advanced Placement courses. Since we now offer an alternative course for less-math-minded students, I feel completely justified in speeding up the pace for these students who specifically chose to take Calculus. I know they can handle the challenge. Overall, most of my students were quite well behaved and attentive during the initial days of class. I’m leery about ever getting too excited about a first week of school. I suspect that students are scoping out the new scene, trying to get a feel for their prey (me) before converging for the kill. Nonetheless, I remain optimistic that with every year of my teaching career I’ll keep on getting more comfortable in my role, and I’ll further enjoy helping my students grow. This looks like a good group of kids, and hopefully that sentiment won’t change by the time I write my next journal entry. 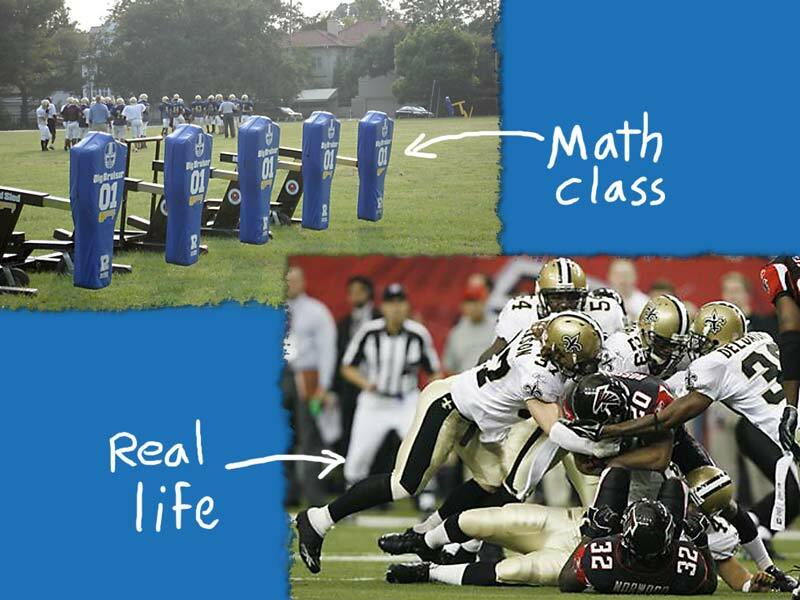 Illustrating an analogy I’ve made in previous years, I tried to convince my students that the abstract cranial workouts one experiences in math class can serve as exercises for real life challenges down the road, similar to how the big metal sleds used in football practice exercise players for the actual game. This image is the “wallpaper” for the computer I use in my lessons. 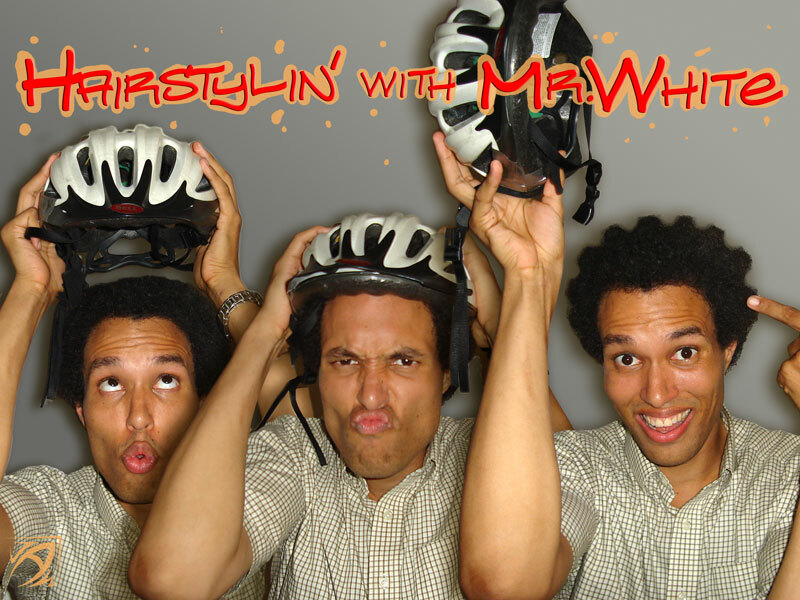 Now that I’m sporting a five month old afro, one of my former students asked what it looks like when I take my bike helmet off. I hope this satisfies her question. Somewhere in my childhood I acquired a red, plastic, asterisk-shaped toy. 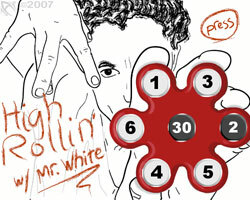 Loosely housed in the middle and at the extremities are five white dice and two black dice. 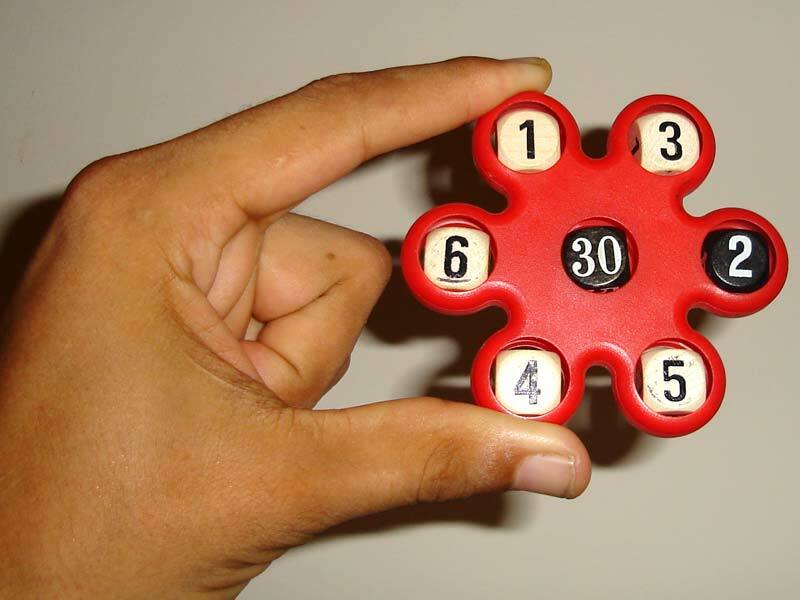 I don’t know what the original intent of the toy was, but for years I’ve had fun rolling the dice and arranging the five numbers of the white dice in a mathematical expression that equals the sum of the two black dice. Many of my students have enjoyed this game too – at least, more than the lesson at hand. Last night and this morning I made a computerized Flash version of the game. In the screen shot shown here, one solution would be 1*6*4+3+5 (white) =30+2 (black). I guess one reason I’ve been distracted with computer projects this week is because all academic classrooms at Lusher had “Smart Boards” installed over the summer. These are essentially electronic white boards, for which the contents written on the board may be recorded and/or manipulated digitally. Furthermore, when hooked up to a computer, it can also act as a giant interactive monitor. It’s got some quirks, but I’m starting to see some intriguing possibilities for enhancing my lessons with this snazzy technology. So of course I need to come up with some interesting computer stuff to share with my students (right?). So far it’s been a fun means for sharing some content, such as my multiplication and division math games of several years ago. The Smart Board is definitely cool, and I’m thrilled with the prospect of not having to inhale chalk dust all school year. 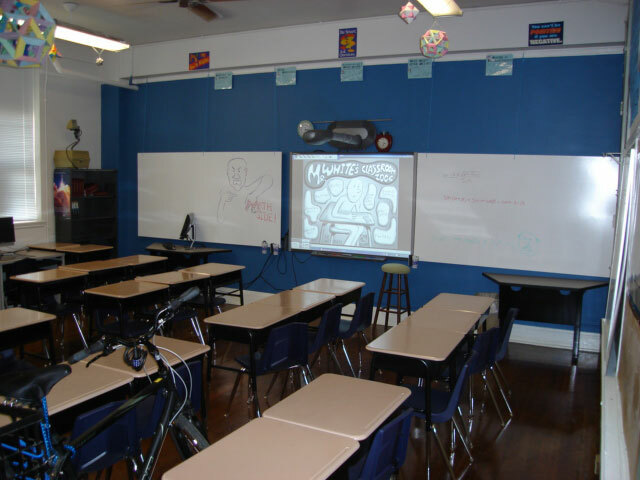 However, many of us teachers longed to have traditional white boards installed on either side of the Smart Board. After we found this wasn’t going to happen, I spent a few hours last weekend rigging some homemade white boards out of white panel board. The big challenge was doing so without violating strict orders against marring the freshly painted walls of the classroom in any way. I ended up using rope and s-hooks to hang the boards from the ceiling trim, and constructing them in such a way to minimize swinging left/right or back/forth. I’ve already pointed out to my classes how my algebra and geometry skills enabled this project. I hung some posters from my Lockheed Martin days on various surfaces throughout the room, trying as much as possible to avoid taping against painted walls. 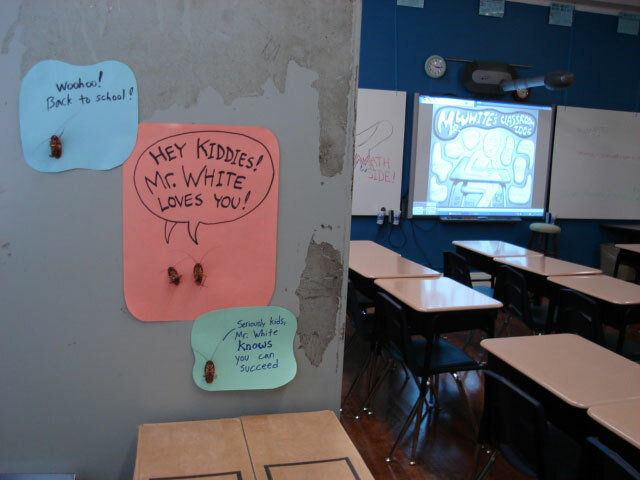 Finally, I feel like my classroom is starting to look like an inviting learning environment. Now, if only I could get rid of that mammoth jet-engine-powered A/C unit whose insufferable rattle led to me shouting my voice hoarse by the end of the week. Oh well, things will never be perfect. I’m thankful for whatever progress we have experienced since last year. Front wall of my renovated classroom, including pseudo-whiteboards on either side of the Smart Board. The side of the gigantor AC unit, adorned with roaches I found in the building. Last spring I finished my requirements for certification. I worry though that if I take a break from coursework, I may never motivate myself to pursue a graduate degree. So, I hesitantly have signed up for two night classes at UNO for the fall semester. Furthermore, over the summer I started checking into whether Tulane’s Reily Recreation Center might offer Lusher faculty a membership price break due to our charter partnership. Their facilities are incredible, and the center is located just a five-minute bike ride away from my apartment. The Reily Center director turned out to be extremely cooperative and helpful. Now, Lusher faculty gets the same rate as Tulane faculty! That’s less than $30 per month, or about a third of the cost of what a normal community membership costs. For the first time during the school year since moving to Louisiana, I’ll have access to a gym so that I may keep my physique sculpted to manly perfection. Part of me wonders whether I’m spreading myself too thin these days. Then again, I’ll only be youngish and studlyish once in my lifetime. I’m excited to see how this year will shape out. Ahh yes, let’s not forget that we’re approaching the traditional peak of the Atlantic hurricane season. The two-year anniversary of Katrina’s landfall is less than a couple weeks away. Right now, Category 4 Hurricane Dean is poised to pound Jamaica with 150mph winds by Sunday, and is projected to reach Texas and Central America by Thursday. Of course, a hurricane’s strength and projected path is always subject to quick and drastic change for better or worse. With all the reasons to anticipate that this will be a fulfilling and fun year, it’s wise to keep in mind how suddenly it might all be taken away.